Banners and flags a-waving, between 1,200 and 1,500 trade unionists from British Columbia, Washington, and Oregon rallied for a couple of hours Saturday (April 2) at the Canada-US border to show solidarity with workers in Wisconsin and elsewhere who are fighting union-busting legislation. Top union brass from BC and both states were among those who addressed the lively crowd, many of them bused in from BC's lower mainland and from points south of the border. Frequently, the lively crowd joined together in sincere, enthusiastic chanting of various slogans. BC Federation of Labour President Jim Sinclair, speaking to the largest Fed-sponsored protest gathering of BC unionists since 2004, warned that "we would fill the streets," if the provincial government ever tried to pass laws similar to what US states are enacting. As a bonus, CLC President Ken Georgetti showed up to give his lungs a workout and rewrite a little history. Three days after Ontario lawmakers had stripped Toronto transit workers of the right to strike, Georgetti had a belated "message for our governments up there in Canada: that you better not even think about it, not even for a minute about what they're doing in the United States." Harking back to 1987, when he was president of the BC Fed, Georgetti gave an impassioned and glowing report on the one-day work-stoppage on June 1 of that year to protest enactment of provincial anti-union Bills 19 and 20. "...even though we had only 250,000 union members in BC, we had 400,000 people" stay home from work, said Georgetti. This caused many a raised eyebrow among those of us in the crowd who remembered that famous day, when certainly tens of thousands stopped work province-wide (the highest, somewhat inflated estimation at the time--by Georgetti's staff--was 300,000). But it affected the union-busting Socred government of the day not a bit. It annoyed their corporate backers, and, what was really the point, it took pressure off Georgetti and other union leaders, so they could revert to their tried-and-untrue tactic of waiting until the next election. 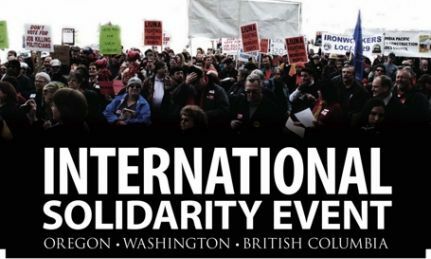 On April 2, the pattern was still in force from 1987--and 2003-2005, when strikes (with significant public support) by ferry workers, hospital workers, and teachers were sequentially sold out in backroom deals with the government by Sinclair and other BC labour leaders. But, after 10 years of union/people-bashing government attacks (which received scant mention), there was no call for BC union members to prepare for battle in any way, no education program proposed, no launching of labour-community fightback coalitions. But then, the size of the April 2 demonstration itself was a testament to the priorities of the BC labour leadership. Eleven days earlier, Sinclair had made some remarks at a solidarity meeting in Burnaby where a Wisconsin teachers' union leader and a brother from the sheetmetal workers were speaking. The Fed boss said he had told Washington and Oregon union leaders that BC would get at least 2,000 people to the April 2 border rally. A few days later, however, a federal election was called. While a couple of BC unions, notably the BCGEU, did widely e-mail members about the rally and line up buses to transport them, most (notably private sector unions) did absolutely nothing. In fact, several people at the rally said they only knew about it from e-mails sent by me. - To see real militancy from the unions in my lifetime. Watching the huge labour marches that just occurred in London really gives you a sense of the total vacuum in BC. Seems like only the lumpenproletariat even remember there's a class war going on! Good piece. This microphone-militancy totally needs to be called out. There is no doubt these two sell us out, time and again. They sold out both general strikes my aunt had a major hand in organizing. I'm going to take it personally from now on, and I don' t even agree with general strikes as a tactical-strategy (not that it would hurt relative to where we are now), but within their microphone-militancy, these guys should believe in general strikes... It totally fits within all their overall movement thinking, yet they still sell it out.